A cute 100% cotton print in turquoise, pinks, purples and reds on one side, super soft turquoise minky (polyester) on the other. Minky color substitutions are welcome. Just let me know in "note to seller" when you check out. Color choices can be viewed in the last photo. 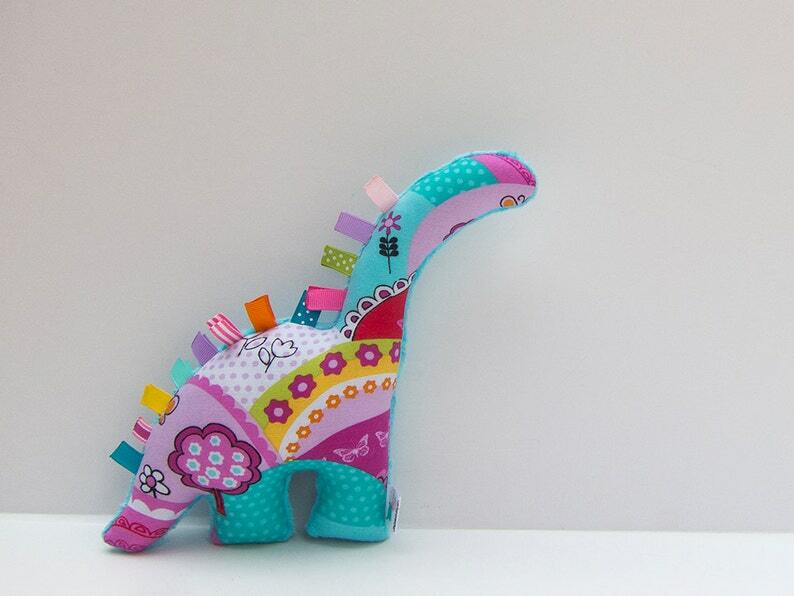 She has coordinating unlooped ribbons sewn in along her back for rubbing, tugging and chewing. Ribbons are triple sewn into the seams and the edges are heat sealed to prevent fraying. Stuffed with polyester fiber, she measures about 7" x 8" and can be machine washed. Simply adorable toys! Love the bright colors. Seller was very attentive and prompt. This is my second purchase and will continue to come back as these make perfect gifts. Plus, great quality and fast shipping. Both toys made the perfect baby shower gift. I love the colors. It is exactly as the picture shows. I just imagined it would be a little bit bigger. Still great for a baby shower gift! it is so cute, love.